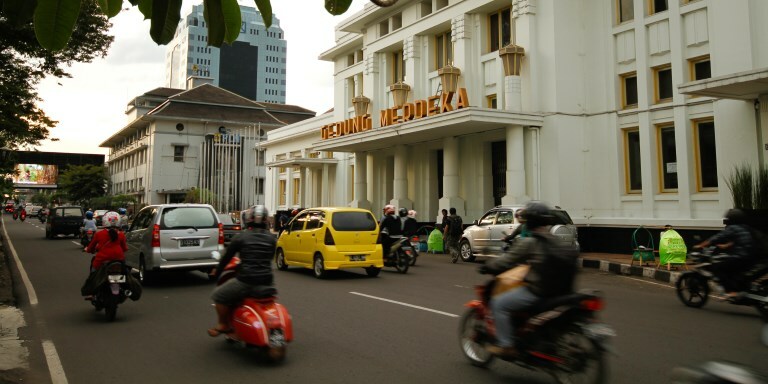 Bandung in West Java, located just south of Indonesia’s capital Jakarta, is one of Southeast Asia’s fast-rising cities. Studies show that the balanced and holistic development of second-tiered cities and towns can help ease the pressure of urbanization on a country’s primary cities. Photo credit: ADB. Asia's rapid urbanization requires the balanced and holistic development of second-tier cities and towns to release pressure from congested megacities. Rapid urbanization is recognized as a defining feature of the 21st century, turning the attention toward the quality and nature of future cities and sustainable communities around the world. Asia’s urbanization is unique as it is happening at a pace faster than any other region, resulting in unprecedented growth in the number of urban dwellers and densely populated megacities. The global development challenges, and in particular Asia’s urban challenges, are daunting and often conflicting, with rising demand for resources and services, growing consumption patterns, the depletion of natural resources, increased air pollution, and more people vulnerable to climate disruptions. Cities have to cope with increased pressure on physical infrastructure, rapid environmental degradation, greater inequality, and reduced social cohesion. The impacts of urbanization on growth and equality, and on both urban and rural poverty, are well documented, but do not discuss alternative models of development. While the relationship between urbanization and growth (and poverty reduction in general) is often well established, less is discussed about the forms and causes of newly emerging urban poverty and exclusion, and how they differ for different city sizes. The working paper "Regional Balanced Urbanization for Inclusive Cities Development: Urban-Rural Poverty Linkages in Secondary Cities Development in Southeast Asia", upon which this policy brief is based, analyzes how poverty can be reduced with balanced urbanization through the development of second-tier cities and secondary towns. It discusses the spatial growth patterns that have an impact on sustainable development and urban–rural poverty links. Based on learnings from Southeast Asia, the following policy options and actions are suggested for urban-rural integration and sustainable urbanization. Balancing spatial settlement patterns through a focus on decentralization and balanced regional development creates more efficient urbanization centers and reduces spatial disparities that will lead to a sustainable growth. Developing provincial capital cities balance regional development, strengthen urban-rural links, and address overcrowding of primary urban centers. Enable integrated urban-rural spatial policies and planning. Urban spatial policies and urban planning can help foster regional and local economic development to enable integration of economic growth and environmental sustainability at all levels and sectors to improve the quality of life for citizens. Decentralize planning and localize action. Strengthening the existing urban centers with established regional governance systems enables ownership of actions and boosts the local economy. Promote economic competitiveness. Build on the existing natural, human resource, and revenue-generating assets of the city and communities. Unlock rural economy through improved connectivity. National urban strategies and policies should enable infrastructure and urban development in existing secondary cities and towns. Build on existing assets and skills. Culture, heritage, industry, and nature are all assets that are often neglected in cities and villages. With culture and tourism playing an important role in a city, joining forces around a shared image of how to develop a city can be enhanced. New urban models of growth are emerging. Investing in development of these emerging spatial forms provide valuable lessons for the cities in Southeast Asia to learn from each other. Development of a cluster of urban areas or satellite cities around the core urban area provides opportunity for a mutually beneficial relationship between the cities. The clustered development approach for small towns also enables clustering of infrastructure, such as a regional landfill, making these facilities financially sustainable for the population sizes. A clustered economy has co-benefits. Megacities will continue to grow but the pressure on these cities can be reduced by providing connectivity and urban infrastructure services to the satellite towns around these large urban agglomerations. Satellite cities are developed through a symbiotic relationship in close proximity to large cities. Rather than being just residential suburbs, satellite cities can become niche market locations in their own right, benefiting from a pool of specialized services in large cities, such as financiers, lawyers, and insurers. Further, being close to a megacity or metropolitan area means easy access to multinational companies and connectivity to global markets through an international airport. On the other hand, the metropolitan area benefits from the satellite cities where manufacturing and secondary services with efficient back-office operations are located. Corridor towns can play an important role in improving regional competitiveness by enhancing economic linkages to their respective hinterlands. This spurs economic growth, leading to poverty reduction. Corridor town development improves market connectivity of the hinterlands. It has a positive impact on the local economy, promotes local products and value chains, and improves tourism. Some areas of activity underscore the interrelation between tourism, environmental management, and urban-rural development. The following points highlight some of these areas where synergistic benefits can be achieved. Supporting SME clusters. A positive development in the tourism sector results in more visitors and increased spending. Small and medium-sized enterprises (SMEs) are the backbone of the tourism sector and would benefit directly from such increased numbers. Improving infrastructure and services. The tourism industry, especially with more tourists, depends on improved facilities and infrastructure, which benefit both visitors and residents. There are various action areas, ranging from small improvements in signage, public restrooms, and public space management to larger-scale improvements in urban design, drainage, and traffic systems. As previous ADB projects have proven, such infrastructure and services improvements provide employment opportunities for residents. Enhancing competencies and capacities through partnerships. At a higher level of skills, there is low capacity even among architects and planners in the Greater Mekong Subregion in applying heritage conservation practices, starting with identification, designation, and restoration of conservation zones. Bilateral projects, such as India’s engagement in the restoration of the temple complex in Cambodia’s Angkor Wat since 1986 and more recently in the restoration of the Ta Prom Temple, have shown that capacities can be built and improved with institutional cooperation. The GrEEEn City Initiative’s concept of Urban Management Partnerships is another example of bringing together more experienced actors in tourism development with other actors willing to learn and apply lessons learned and best practices. Benefitting socioeconomic development. Tourism is an important instrument in socioeconomic development, as social contacts between tourists and locals increase mutual understanding and cultural exchange. Additionally, integrated urban development should be based on participatory processes and the buy-in of key stakeholders. The city governments in collaboration with development partners, private sector, and civil society can take the lead in optimizing cross-sector synergies to enhance urban-urban integrated development based on a shared vision of how urbanization and economic growth can be achieved in an environmentally friendly, socially inclusive, and financially viable manner. ADB's Urban Operational Plan, 2012‒2020 provides direction on how to respond to the challenge of rapid urbanization by supporting investments in sustainable urban development based on the 3E approach—economic competitiveness, environmental sustainability, and social equity. An integrated approach to urban development will ensure sustainable and livable cities that are competitive, inclusive, and green. The equity pillar under the Urban Operational Plan promotes inclusive urban development based on the underlying principles of accessibility, affordability, resilience, and sustainability. The approach for inclusive urban development is outlined in the ADB publication, Enabling Inclusive Cities: Toolkit for Inclusive Urban Development. Inclusive cities is an integrated approach encompassing sustainable, resilient, accessible, and affordable solutions to the challenges faced by the urban poor and vulnerable groups by enhancing their access to urban services and infrastructure through targeted investments such as participatory planning, informal settlement upgrading, urban housing, resilient urban infrastructure, community services, and livelihood development. This integrated approach encourages an institutional planning and delivery mechanism that brings together all institutions and stakeholders—government, private sector, civil society—who have the capacity to deliver systems for inclusive urban service delivery. The approach proposes that the capacity of urban poor communities, informal settlement networks, and nongovernment organizations should be effectively used in conjunction with the city government and private sector. ADB's Strategy 2020 states: "To transform the archetypical chaotic, polluted, inequitable city of Asia into a competitive, equitable and environmentally sustainable urban region—in short, a livable city—will require a new approach to city development and to ADB's support for that development. Core to the transformation is a new emphasis on the need for an integrated planning approach to the provision of environmental infrastructure and services and other public goods." A smart systems approach for integrated planning and urban-rural development is one that envisions urban challenges from a holistic perspective by integrating the rural issues as part of the urban system. Strengthening Institutional Structures and Capacity. ADB. Enabling Inclusive Cities: Toolkit for Inclusive Urban Development. Unpublished. ADB. 2013. Urban Operational Plan 2012–2020. Manila. ADB. 2014. Manual for Undertaking National Urban Assessments. Manila. F. Steinberg and M. Lindfield, ed. 2011. Inclusive Cities. Urban Development Series. Manila: Asian Development Bank. R. N. Singru. 2015. Regional Balanced Urbanization for Inclusive Cities Development: Urban–Rural Poverty Linkages in Secondary Cities Development in Southeast Asia. ADB Southeast Asia Working Paper Series No. 11. Manila: Asian Development Bank.